Within the last century, and especially since about 1900, we seem to have discovered the processes by which fame is manufactured. Now, at least in the United States, a man’s name can become a household word overnight. The Graphic Revolution suddenly gave us, among other things, the means of fabricating well-knownness. Discovering that we (the television watchers, the movie goers, radio listeners, and newspaper and magazine readers) and our servants (the television, movie, and radio producers, newspaper and magazine editors, and ad writers) can so quickly and so effectively give a man fame, we have willingly been misled into believing that fame well-knownness is still a hallmark of greatness. Our power to fill our minds with more and more big names has increased our demand for Big Names and our willingness to confuse the Big Name with the Big Man. Again mistaking our powers for our necessities, we have filled our world with artificial fame. Of course we do not like to believe that our admiration is focused on a largely synthetic product. Having manufactured our celebrities, having willy-nilly made them our cynosures the guiding stars of our interest we are tempted to believe that they are not synthetic at all, that they are somehow still God-made heroes who now abound with a marvelous modern prodigality. Kim has mastered the art of taking flattering and highly personal photos of oneself. 1954, and a time of creation. Marilyn Monroe marries Joe DiMaggio. Bill Haley releases Rock Around the Clock. Sports Illustrated puts out its first issue, and the Miss America pageant is broadcast on TV for the first time. The first nuclear submarine is commissioned, and the first nuclear power station comes online. The territorial excess of the post-war boom is funneled into home appliances, sedans the size of small boats, and the Red Scare. Its when the country starts taking stock of itself and figuring out what kind of century its going to have, now that theyve toppled the Axis and emerged under sunny skies. Its also a tipping point for the way Americans are able to see themselves in the mirror of visual media: in 1946, only 0.02% of American households had a television set, but by 1954, that figure has exploded to 59.4%. More than half of all U.S. homes now had a glowing box in the corner of the living room that let them gaze for hours at the faces of actors, actresses, comedians, composers, authors, emcees, and anyone else who managed to, however temporarily, step over the firmament that separates viewer from viewed, consumer from provider. Its a box that gives you the ability to gawk at famous people that actively encourages you to do this and to daydream about what their lives must be like. Crucially, though, its a device that doesnt just reflect fame, but create it. Get yourself on TV, and you can be a household name, instead of the other way around. In other words, it was the beginning of the era of the self-reflexively famous, and nobody quite knew how to handle it. That sense of unease, of nervous laughter, is shot through 1954s It Should Happen to You, directed by George Cukor from a script by Garson Kanin. It is, ostensibly, a comedy, but this is a little like saying Romeo and Juliet is about a couple of young kids in love. Its got plenty of laughs, sure. 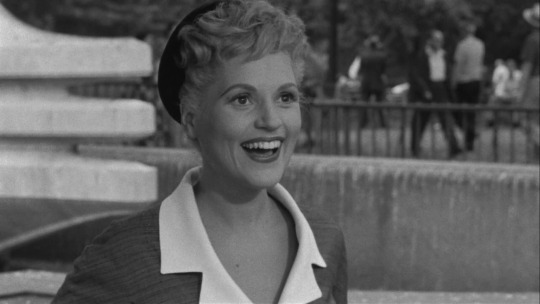 Judy Holliday stars as a woman with aspirations of fame, and she finds herself in a triangle between a scheming executive (Peter Lawford) and an earnest documentarian (Jack Lemmon, in his first major role). Holliday plays her part with sparkle, and Lemmon is so pleasing youd never suspect it was his big-time debut. Part of the misconception can be chalked up to the marketing, too: key art and trailers for the film paint it as a kind of laugh riot or hilarious screwball trip, set against the city that never sleeps. But its a film plagued by worry and colored by darker things, and the comedy is shaped by the storys grim satire of a new generation that seemed to seek fame above all else. What seemed outlandish sixty years ago, though, is now commonplace, and as a result, to modern eyes the film often plays almost flat, and beats that wouldve been surprising to post-war viewers feel instead inevitable. Its a film worth watching for many reasons, but its prescience tops the list. Gladys Glover (Holliday) seems to come out of nowhere. We meet her wandering in Central Park, and her backstory is only sketched out via an exposition dump when she strikes up a conversation with Pete Sheppard (Lemmon), whos shooting B-roll for a documentary about city life: shes been in the city a couple of years, modeling girdles until she was fired for being a fraction of an inch oversize, and now shes unemployed and struggling to find meaning in her life. She lets Pete film her for a bit, but importantly, shes more infatuated by the idea of seeing herself in an eventual film than she is in anything he has to say. Shes less a person than a force of will; a physical representation of the thirst for notoriety. Shes not malicious, though. Kanin doesnt paint her as a murderer or sociopath. She just wants renown, and she trusts that her desire necessitates worth. “Within the last century, and especially since about 1900, we seem to have discovered the processes by which fame is manufactured. Now, at least in the United States, a man’s name can become a household word overnight. The Graphic Revolution suddenly gave us, among other things, the means of fabricating well-knownness. Discovering that we (the television watchers, the movie goers, radio listeners, and newspaper and magazine readers) and our servants (the television, movie, and radio producers, newspaper and magazine editors, and ad writers) can so quickly and so effectively give a man “fame,” we have willingly been misled into believing that fame — well-knownness — is still a hallmark of greatness. Our power to fill our minds with more and more “big names” has increased our demand for Big Names and our willingness to confuse the Big Name with the Big Man. Again mistaking our powers for our necessities, we have filled our world with artificial fame. 1954, and a time of creation. Marilyn Monroe marries Joe DiMaggio. Bill Haley releases “Rock Around the Clock.” Sports Illustrated puts out its first issue, and the Miss America pageant is broadcast on TV for the first time. The first nuclear submarine is commissioned, and the first nuclear power station comes online. The territorial excess of the post-war boom is funneled into home appliances, sedans the size of small boats, and the Red Scare. It’s when the country starts taking stock of itself and figuring out what kind of century it’s going to have, now that they’ve toppled the Axis and emerged under sunny skies. It’s also a tipping point for the way Americans are able to see themselves in the mirror of visual media: in 1946, only 0.02% of American households had a television set, but by 1954, that figure has exploded to 59.4%. More than half of all U.S. homes now had a glowing box in the corner of the living room that let them gaze for hours at the faces of actors, actresses, comedians, composers, authors, emcees, and anyone else who managed to, however temporarily, step over the firmament that separates viewer from viewed, consumer from provider. It’s a box that gives you the ability to gawk at famous people — that actively encourages you to do this — and to daydream about what their lives must be like. Crucially, though, it’s a device that doesn’t just reflect fame, but create it. Get yourself on TV, and you can be a household name, instead of the other way around. In other words, it was the beginning of the era of the self-reflexively famous, and nobody quite knew how to handle it. That sense of unease, of nervous laughter, is shot through 1954’s It Should Happen to You, directed by George Cukor from a script by Garson Kanin. It is, ostensibly, a comedy, but this is a little like saying Romeo and Juliet is about a couple of young kids in love. It’s got plenty of laughs, sure. Judy Holliday stars as a woman with aspirations of fame, and she finds herself in a triangle between a scheming executive (Peter Lawford) and an earnest documentarian (Jack Lemmon, in his first major role). Holliday plays her part with sparkle, and Lemmon is so pleasing you’d never suspect it was his big-time debut. Part of the misconception can be chalked up to the marketing, too: key art and trailers for the film paint it as a kind of laugh riot or hilarious screwball trip, set against the city that never sleeps. But it’s a film plagued by worry and colored by darker things, and the comedy is shaped by the story’s grim satire of a new generation that seemed to seek fame above all else. What seemed outlandish sixty years ago, though, is now commonplace, and as a result, to modern eyes the film often plays almost flat, and beats that would’ve been surprising to post-war viewers feel instead inevitable. It’s a film worth watching for many reasons, but its prescience tops the list. Gladys Glover (Holliday) seems to come out of nowhere. We meet her wandering in Central Park, and her backstory is only sketched out via an exposition dump when she strikes up a conversation with Pete Sheppard (Lemmon), who’s shooting B-roll for a documentary about city life: she’s been in the city a couple of years, modeling girdles until she was fired for being a fraction of an inch oversize, and now she’s unemployed and struggling to find meaning in her life. She lets Pete film her for a bit, but importantly, she’s more infatuated by the idea of seeing herself in an eventual film than she is in anything he has to say. She’s less a person than a force of will; a physical representation of the thirst for notoriety. She’s not malicious, though. Kanin doesn’t paint her as a murderer or sociopath. She just wants renown, and she trusts that her desire necessitates worth.